Friendship Commanders: PRE-ORDER THE GARFIELD EP NOW! PRE-ORDER THE GARFIELD EP NOW! The GARFIELD EP is now up for pre-order! The EP will be released on October 17th, and at that time, we will send out all pre-ordered cassettes (which each include a digital download) AND make the freestanding digital download available. For now, we're just allowing the order of the hard-copy tapes. There are only one-hundred in existence, they're each hand-numbered, and one dollar of every EP sold will be donated to animal rescue efforts. The third track, "Jean Dark," is up for preview and will also download immediately with your pre-order. To celebrate the new music, we're having a proper release show at Nashville's own Stone Fox. We'll be joined by Shadraq as well as Desmond, the new project by Duane Denison and Paul Allen. The evening promises to rule, so get tickets now! Speaking of tickets, the Loved Ones reunion show we're playing at Bowery Ballroom in February? SOLD OUT. That's right - in five days, no less. Can't wait. Last, but not least, we're stoked to report that we're officially part of the Death Wish Coffee family. 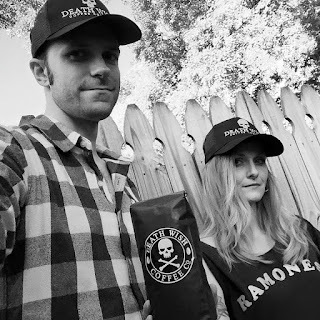 We make caffeine-fueled music, and they make damn good coffee. Win/Win!